Amelia Langston, MD, and Edmund K. Waller, MD, PhD, lead the Bone Marrow and Stem Cell Transplant Center at Winship. 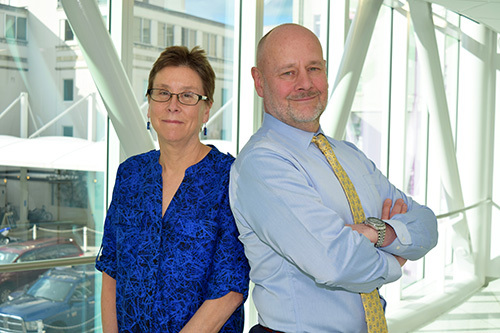 Twenty years ago, Edmund K. Waller, MD, PhD, and Amelia Langston, MD, joined forces to manage the growth of patient care and research at the Bone Marrow and Stem Cell Transplant Center at Winship Cancer Institute of Emory University. Waller is now director of the Bone Marrow and Stem Cell Transplant Program and Langston is medical director and section chief of the Program. Started in 1979, Winship's transplant program was one of the first in the country and is the oldest and largest in the state of Georgia. Winship's Bone Marrow and Stem Cell Transplant Center is internationally recognized for its research and treatment of blood cancers and disorders, and Emory is one of a group of 20 elite transplant centers in the Bone Marrow and Transplant Clinical Trials Network, an organization funded by the National Institutes of Health (NIH). To date, Winship doctors have transplanted over 5,600 patients with leukemia, lymphoma, multiple myeloma, myelodysplastic syndromes, myeloproliferative disorders, myelofibrosis, aplastic anemia, and sickle cell anemia. When the program started, only a few patients were transplanted each year. Emory saw a huge unmet need for the transformative treatment and set out to expand the program by recruiting Rein Saral, MD, a bone marrow transplant specialist from Johns Hopkins. During the 1990s, Saral put together a team of scientists and translational physicians, who took what was learned in the lab and put it into clinical practice to improve outcomes for patients. Waller and Langston were brought in during that growth period. "We took off fairly rapidly over a year or two and built a highly competitive clinical program, but just as importantly we really enhanced the pre-clinical, scientific components of the program," said Saral, now Professor Emeritus of hematology/oncology. "I was hired to help build the scientific platform to support stem cell transplantation. I love this work, and the chance to understand how and why transplant is successful," said Waller. Waller described his research in graft-versus-host disease: "We made initial clinical observations on patients transplanted at Emory, and used these insights to help design a nation-wide randomized clinical trial of bone marrow versus blood stem cell grafts in patients receiving transplants from unrelated donors. Our NIH-funded laboratory has helped understand why patients who received blood stem cell grafts develop more chronic graft-versus-host disease. This has been a chance to do translational science in the best way, taking lessons learned from patients into the lab setting, and using science to make clinical care better." Today, the transplant experience is easier for patients and outcomes have improved because of advances in anti-rejection drugs, reduced chemotherapy conditioning, better medicines for treating nausea, better methods for collecting stem cells, improved supportive care, and much shorter stays in the hospital. For many Winship patients, transplant provides decades of cancer-free survival. "There have been huge advances in terms of better antibiotics, better antifungal and antiviral medicines, and supportive care. We have participated in pivotal trials leading to approval of new agents and the adoption of new practices," says Langston. When Waller and Langston took over the leadership of the BMT program 20 years ago, they set out to make the transplant process less risky and more effective by building teams of scientists focused on translational research and medical staff specializing in the full continuum of care before, during, and after transplant. Today, over 200 physicians, advanced practice providers, nurses, and support staff see the hundreds of Winship transplant patients cared for every year in Winship clinics and in Emory hospitals. "Our doctors have had years of experience in treating patients and each of us has transplanted hundreds of patients. We've seen every possible condition occur and we've gained expertise with the problems of transplants and the ways to address those problems and restore patients back to health," says Waller. Waller and Langston say they are most proud of building a dedicated team of Winship physicians, advanced practice nurses and physician assistants, pharmacists, nurses, social workers, dieticians and therapists who have brought experience, expertise, and compassion to the program and helped transform this life-saving procedure.